Dill is a fabulous but somewhat underused herb. It's useful for canning pickles, of course, but it is also a great addition to many homecooked meals. However, if you grow your own dill or buy your dill fresh at a farmer's market or grocery store, you'll find that it wilts very quickly. Fortunately, dill can be preserved in a number of ways that will provide that fresh dill taste whenever you need it in cooking. If you are growing your own dill, make sure to pick it at peak freshness. As with most herbs, it's best to harvest later in the morning after the dew has evaporated, as this is when the plants are more flavorful. For the dill, you plan to use in the next week or so, place the stems in a water-filled jar, as though they were cut flowers. This is an easy way to keep many herbs fresh for up to a week. The remaining dill can be preserved using one of the following methods: freezing, drying, or in a prepared vinegar. Stored frozen, intact dill sprigs will remain usable well into the winter, and possibly even until spring. Remember that if you intend to use the dill in canned goods, it is best to freeze both the leafy stems and the flower heads. This will maximize the flavor impact of your dill. Rinse the dill fronds and flower heads with water to remove any dust and insects. Shake the herbs gently to remove most of the moisture. Thoroughly dry the dill by allowing it to hang upside down to maintain the best shape. You can also lay it out on an absorbent material, such as layers of paper towels. Do not let the dill get crispy dry—you simply want it to lose most of its moisture. 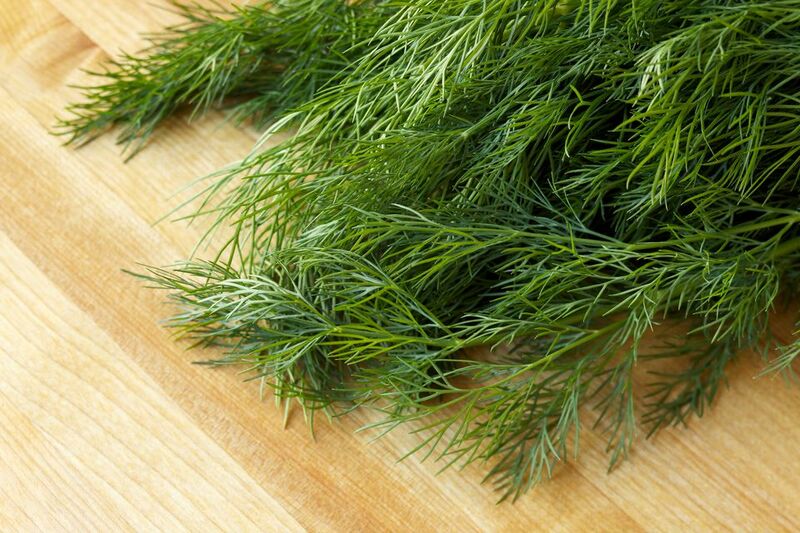 Place the washed and dried dill into an airtight container, such as a pail, and seal it tightly. If your container allows the herb to sit upright, the dill will continue to keep its attractive shape in the freezer. Place the container in the coldest part of your freezer until needed. If you don't have room in the freezer for a full container of dill, you can also store it as a dried, ground herb. This is a convenient way to add the herb to a variety of food dishes and it is similar to how you might dry and preserve other herbs, such as basil and oregano. If you have a large dill harvest, you might consider both using both freezing and drying methods to give yourself options when cooking. Allow the dill sprigs to hang upside down in bundles for about 1 to 2 weeks. When the herb becomes crispy and crumbles when you pinch it, it is ready for storage. Working over a large bowl, crumble the leaves from the stem and into the bowl. It should be a quick task; if the dill is dry enough, you can grind it very fine using just your hands. Once the dill is ground to your liking, place the dry dill in a glass jar with a tight-sealing lid. As with most dried herbs, dill will remain flavorful for about a year. Another way to preserve dill is by capturing its taste in vinegar and storing it for use whenever you need it in recipes. In a small bowl, crush the chopped dill leaves with a wooden spoon. In a saucepan, heat one cup of the vinegar until itis warm but not boiling. Place the whole dill sprigs into the warmed vinegar and allow them to soak up vinegar. Separate the dill sprigs from the vinegar and pour the hot vinegar over the crushed dill in the bowl. Mix well. Allow the mixture to cool, then add the remaining vinegar. Mix well. Using a funnel, pour the mixture into the decorative bottle through a double layer of cheesecloth. (Optional) add the warmed fresh sprigs of ill, including a few seed heads into the bottle for ​a decorative appearance. Label and store the bottle. These attractive bottles may be displayed in the open on the countertop.